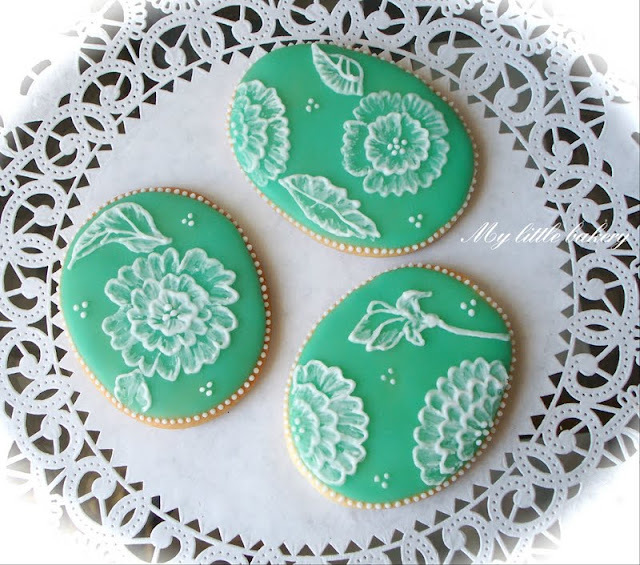 I love this technique for cookie decorating. It is very important to make royal icing the right consistency. While rubbing egg white, gradually add sugar (do not beat egg whites). At the end put cream of tartar, lemon juice and essence. Consistency should not be too thick, but not liquid. How did you do that? How did you get that pale green shading? They look like the perfect thing to take to a party when you want to impress people! 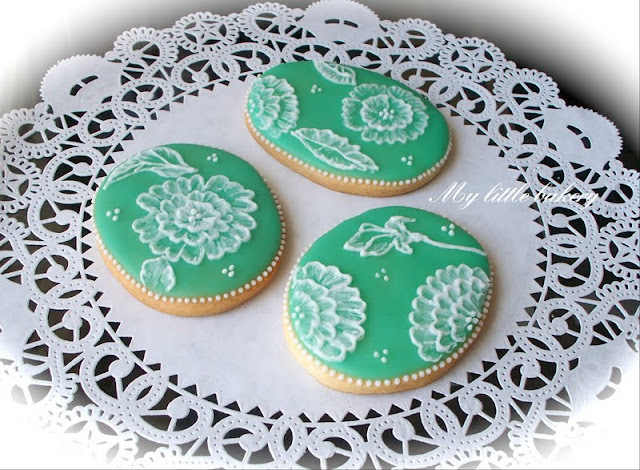 These cookies are just lovely. Too beautiful to eat! You certainly have a talent. I've tried this technique before, but yours turned out much better than mine. Beautiful!! What is a "crude egg"? Thanks so much for linking up to Bacon Time. Our first party was a big hit with over 300 links. I can't wait to see what you have for me next week. I have a special give away planned just for linkers at the party. I would love it if you would add my party button to your lovely blog or a link back to the party. Thanks again. Your cookies are stunning. These are SO pretty! Just amazing work. Marvelous things!!! This is real ART!!! WHAT DO YOU MEAN BY "RUBBING THE EGG WHITE"? SO YOU DON'T BEAT THE EGG WHITES? YOUR WORK IS EXTREMELY AWESOME!!!!!! Thanks! I mix the egg whites with the sugar by hand. Can you tell me if the royal icing is hard to bite through when it dries? Almost every recipe I've tried is really tough to bite through. I'm in awe with your artwork! Your an incredible inspiration! Thank you for sharing your talents. Yes, royal icing becomes solid after drying. That's why I prefer to use a glaze for the basics, but for the details - icing. Hey, Nadia! I got as far as two cups of confectioner's sugar, and it got too hard for working. I added a 1/4 teaspoon water and it became softer to work with. The glaze recipe was good for me, but this royal icing one seems to not like me. I'll thin it down a bit and use it for glaze. At least things don't have to go to waste. I have a bunch of cookies to make up for this Saturday!